Ah, the chambray shirt. It gives me mixed feelings. Chambray has been a go-to in my closet for years. So much so, that I’m almost tired of it. It doesn’t really feel like my style anymore. I’ve thought about nixing it from my closet. But the thing is, I keep reaching for it. Regularly. Remember on Tuesday, when I told you I’d started the hanger challenge? It’s only been about a week and a half, and my chambray shirt hanger is already flipped around. I’ve worn it twice — around the house and out to dinner. Obviously something is working. Even though I don’t totally love the vibe it gives off, something about it is familiar and comforting — perhaps it’s sort of like a security blanket. Pair it with clogs or mules. I’ve paired mine with clogs here, and I can’t help but feel more myself in them. Tuck it into dark rinse flare jeans. Create contrast, but update it with flares instead of skinnies. Pair it with black denim cutoffs and lace up sandals for a cool look. What about you? Are you in the same boat with your chambray shirt — kind of uninspired with it, but still wearing it a ton? Or are you still full speed ahead with it? What’s your favorite way to style it? Share away and maybe we’ll all get a few new ideas! I really like to wear mine under a sweatshirt, with the collar and shirttails peeking out. Also I like it tucked into a full skirt, or into a mini-skirt for that matter. And into skinny overalls! I actually have two chambrays, one very much like yours and one with little white polkadots (both old Madewell shirts) and they both just seem to get better and softer with age, which is kind of weird! Not that I’m complaining, hah. 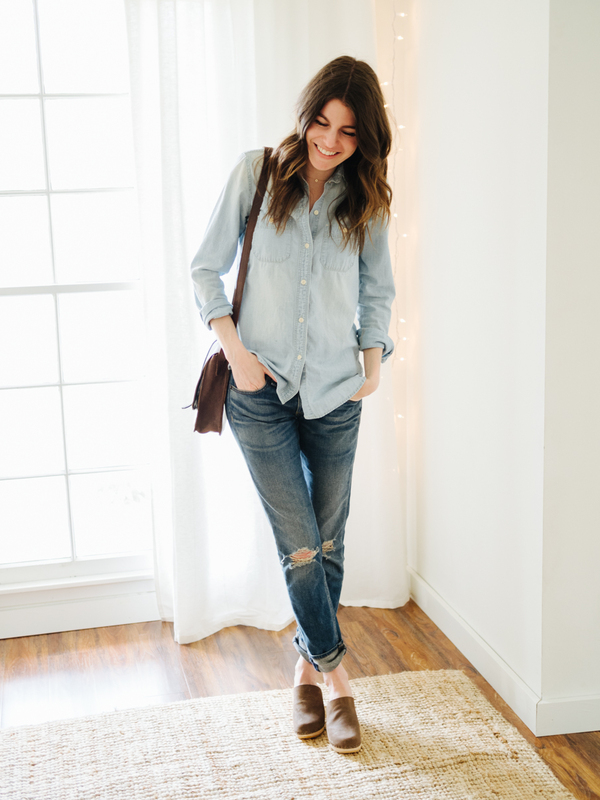 Chambray with flare jeans sounds like such a cool outfit recipe! I hope you do that one soon! I feel the same way! I wonder if chambray is sort of outdated now, but I still love to wear it. I pair it with black jeans, black leggings, black maxi skirt, yellow and mint pants! The possibilities are endless. I just don’t get excited about them anymore, but that’s okay. It’s a classic staple of my wardrobe at this point – not special, but hard working. Try changing the buttons. The shirt fits well and looks good on you so I think it’s the buttons. For your style (and mine) I’d choose a natural wood button, possibly unstained. Huge fan of my denim shirt! It is a more form fitting w/snap buttons. Soft material & light blue. I tend to wear it with my ripped jeans & Western booties-due to the snap buttons. A cool leather belt works too-tuck into jeans on 1 side. I feel like an Austin girl all over again. Lastly, I tried on some blue jean shirts in the store, but they were kinda loose & sloppy-I like a more fitted type. I think it depends on buttons, darts or not, pockets, type of material, and so on. Why not challenge yourself and just put it away for a month? See it again for April Fools day. I’m in a similar boat with chambrsy. Thanks for your advice, looking to see what others post…. I have two chambray shirts, one is a darker, longer almost shirt dress that I wear on cooler days. At the moment I’m wearing it with a thermal polo neck under as it’s still cold in the UK, and leggings or skinnies. I have a pale chambray plain peasant blouse that I wear in summer with loose trousers or jeans. Both are very useful. I have the same feelings for my chambray shirt! When that happens, I pair it with unexpected (for me) items: cognac ankle pants, black tweed skirt with dark gray cardigan, winter white cords. An idea I’ve had, but haven’t pulled off yet — wearing my shirt over a tee. White is the obvious choice, but maybe trying a color? I really like Chambray. It’s really easy to wear it with different things or create different looks. The one i have is Halogen brand and it’s super soft too. My favorite way is to style it with black skinny jeans and black booties. Sometimes for a weekend and sometimes for a more casual work day. I felt the same about my denim shirt until I decided to iron some nice patches on it..now it feels new again and I love to wear it! I tired of chambray in the 1990’s and have no urge to revisit those times by wearing it again. Ha ha, me too. It’s on every capsule, travel, or wardrobe staple list and I just can’t do it. If I could go back to all the clothes I wore in the 90s I happily would. I’m still in love with my chambray. It feels timeless time, like my black skinnies. Love your styling. Another thought is a patterned chambray. I have one with subtle white dots. It’s a fun spin on a classic. I actually love my chambray shirt. I bought soo many until I found one that fit right. Lost weight and gave that one to my mom. I now have a gap one that I wear frequently. I can dress it up or down. So if I’m shopping with the girls, running errands, dinner with the in laws or in class at school it just works well with everyday. I love wearing mine with a pencil skirt or full skirt to go out for date night. It seems to work all year, summer and winter. When something stops inspiring me, I often put it on hiatus for a while and wait for it to feel fresh again. I think you’ve done that before — maybe it was even with this chambray! – How much do you/did you love the piece? – Does it still fit? Will it likely fit again? – Was it well made or is it still in good condition? – Is it a classic or neutral piece? You could also ask the question of whether something else might fill that space in your wardrobe better. I have one of those in my closet right now. Good luck to you, C! yes girl I am so in the same boat! 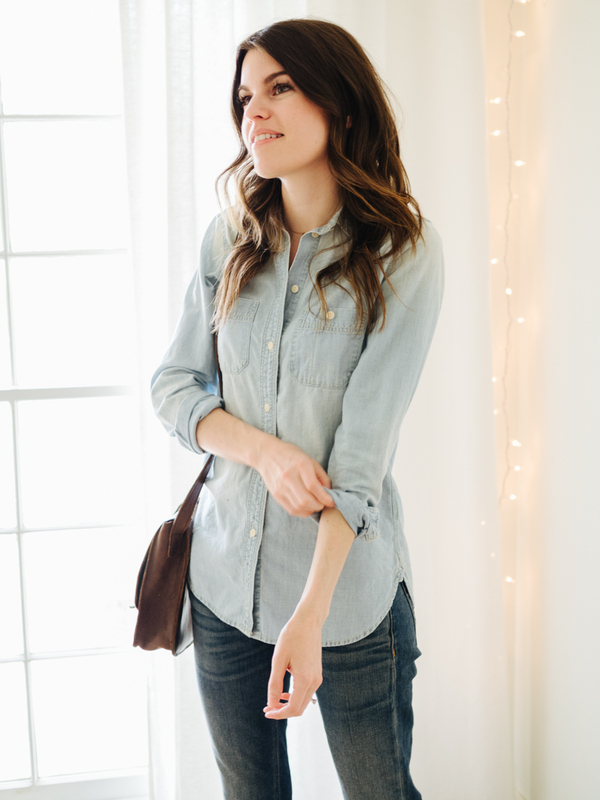 I did a post when I first started blogging sharing multiple ways to wear my chambray shirt. I find myself reaching for it on a weekly basis and I love it but at the same time am so bored with it. if you come up with any other ideas to style it let me know! I get the same feeling with my chambray shirt. Mine has cute little polka dots on it and sometimes I like it for that reason and other times I hate it for that reason. I used to wear mine all the time, but recently, I haven’t been reaching for it. I kind of feel like mixing it up with a plain chambray or maybe an embroidered one. This post came at such a needed time. I recently pulled out my chambray top from storage, and for two weeks I have been trying to style it, and every time something feels off. It’s still too cold for shorts where I live, but the last combo sounds beautiful. I will have to try it when it gets warmer. Don’t we all have an item like that in our closet? The one that we say we’re tired of? The one that we think isn’t “me” any more? The one that we feel has gotten boring/blah? The one we find we’re STILL reaching for constantly? Lol! I think you’re right and we just have to find new ways to wear that item. Because, obviously, there is something about that is “just right” about it on so many levels if we reach for it repeatedly! I like mine open and layered over a white cami with maxi skirt and sandals, almost like a light denim jacket. Or with a super fancy lace skirt and big sparkly necklace for a night out…with clogs or biker boots to keep the fancy/ simple contrast going. I never wear mine with jeans…it feels too ‘double denim’ but I might just be inspired to try it with my new black kick flare crops. No comments yet? Well I’ll be the first. I don’t have anything chambray actually because I don’t really like how ordinary it is. But for some reason, I’ve been coming up with a lot of ways to style a chambray skirt so maybe I ought to get one! Oh my they just weren’t showing for me until now. I enjoy the half tuck and though I didn’t do this last time I really enjoy rolling the sleeves as well. Embrace the casual! I feel like it would work with your toque, a cardigan, and a pair of thick socks on a cooler day as well. Caroline, how much of your inspiration for creating new outfits comes from comments on your blog, how much from looking at Pinterest etc., how much from people around you and lastly, how much of it comes from deep inside with absolutely no idea what it’s from? Ha, I asked myself the same question and gave myself the same answer. Only I don’t have a blog. I do however love styling. I even get into designing clothes and sewing them myself sometimes. That’s what I ask myself too…would I buy it again, right now? If the answer is no, I generally let it go. Sometimes, I just move it to another season…which have different styles (flavors?) . My spring wardrobe is preppy…my fall wardrobe is more…relaxed Texas? Anyway, my point is that sometimes, it works better in a different season or time of year, when you can style it differently. I’m pretty sure you’ve been on the fence about this shirt before…might be time to trade it or let it go… whateould you replace it with? I know exactly what you mean! I have the same chambray shirt from Madewell and wear it ALL THE TIME. For the last year it’s made me feel kinda blah when I wear it, usually with blue or black jeans. I’ve found that that changing how I do my hair makes me feel differently in it. Maybe that’s true for any outfit, but i’ve found that it makes a huge difference with this shirt. A bun gives it a totally different feel from hair all down or half up. Half up or down is my favorite with this shirt. I don’t wear mine with denim either, but it’s a staple of my spring and summer wardrobe paired with olive green khaki style skinny pants, or over casual summer dresses as a layer. A personal shopper told me several years ago to look at chambray as you would your white shirt. Wear it with everything in same ways as white. I have 4 Linen shirts: 1Chambray, 2 whites, 1 beautiful plaid in light blues & white. Wear them all the time—- all year…. with everything. I did purchase a new chambray last summer because my well worn but never worn out chambray no longer fit me the way I am moving into wanting my clothes to fit(more flowing). My new one is linen and flows and I still choose it often and remind myself it is the equal to my white. Yours looks wonderful on you! Chambray is for our generation what the white button down is for our mom’s generation (except easier to keep clean, go us). I always feel pulled together when I wear it. I have a western-ish light wash and a more traditional menswear cut with a darker wash. Both are frequently worn items from my closet, but I do wonder if I wear them too much. And is that wrong? I passed on my thinner chambray shirt since I just didn’t reach for it very often even though I liked it when I wore it. 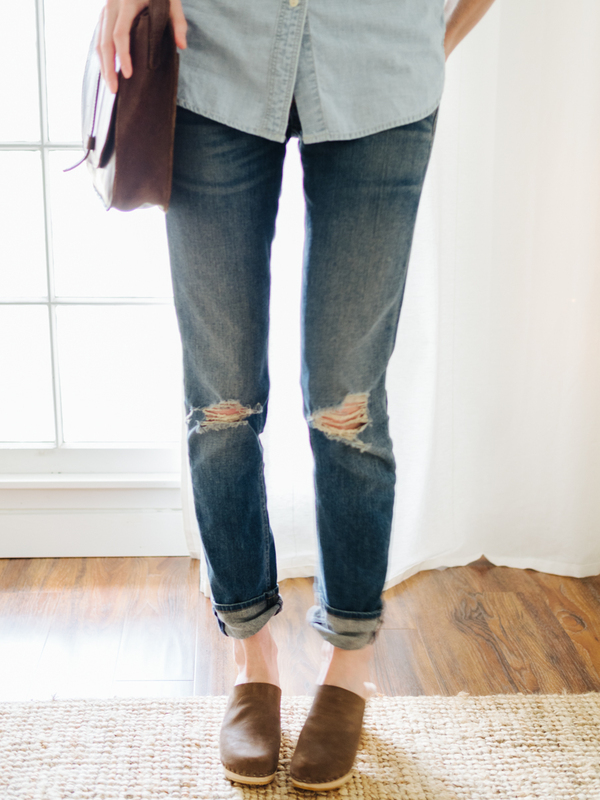 But I have this thicker denim one which I got at madewell when chambray was insanely popular and I love it. It’s a soft thick shirt and I usually wear it more like a cardigan. It especially gets a ton of use in the summer since I love it with shorts. It feels more interesting to me than the more standard chambray. I have one chambray and its a medium wash so I always feel like its not enough contrast with jeans, e.g. a little too Britney and Justin when they wore matching denim. Also I usually wear mine open, so it gets worn mostly at those times when the weight of it is right, and I’m looking for something in between a sweater and a jacket. I like mine with black skinny jeans and a tank or over short summer dresses. Gabby, that’s exactly how I wear my chambray too. It’s a spring/summer staple for me. That’s funny, I’ve been eyeing chambray shirts for awhile and just finally bought my first one! I like to layer it with girly shirts– lace, or my peplum top, or one with an embellished neckline. I searched “chambray shirt” on Pinterest before I bought mine, to get as many different style ideas as I could; I’m anxious to try it layered, unbuttoned, under my green cargo jacket too (like a double jacket). Don’t give up on it yet! haha, me too, I just bought my first one on clearance a couple months ago. I know it’s been trending for years but for some reason it just didn’t seem like me, and then I found this one for $5 and I figured, what the heck, I’ll try it out! I think your chambray shirt looks great on you. I, however, was so sick and tired of mine that I got rid of it. And would not ever buy it again. But realized there was a hole left in my wardrobe. What I realized is that it’s the light blue that wasn’t working or inspiring for me. So I replaced it with a beautiful [to me] indigo cotton/linen shirt that I absolutely love and will for years and years and years.The ‘hand’ is so soft, it feels like a best friend already and the indigo looks better and complements my complexion more so than the faded blue. I wear it with blue jeans, white jeans, skirts, shorts, dress pants, etc. and it works because I feel like myself in it, no matter what I pair it with. Ever dye your clothes? I actually purchased some indigo dye, but have not tried it yet…maybe this summer…. I’ve dyed clothes before! It was easy, but WARNING…the dye will continue to leach out in future washes, so COLD wash only and with like colors! Hey Caroline! I have noticed the same thing about chambray, and for me I think it’s this—chambray has texture and it’s not really a *color*, so it’s a perfect neutral. That said, lately it feels overused and a little farmer-y…but I keep wearing it! It’s nice bc it has a little more structure but isn’t too hot. I love chambray tucked into a maxi-skirt. Dress it up or dress it down. I think it it’s a great staple to have! Yes, of course Abby! Good post idea. :) A couple of my favorites right now are Hackwith Design House, Eliz Suzann, and denim made in the USA (easy to find on Nordstrom’s website). Good luck! Add some details like the button idea! I want to put leather tabs to hold the sleeves up or change out/ sew/glue something over a pocket (leather? Southwestern inspired fabric?). Something to mix things up. I just bought a new chambray in a darker color from Athleta (http://athleta.gap.com/browse/product.do?cid=49982&vid=1&pid=350166002). Its super soft and I can wear it so many different ways. My favorite is with black leather leggings and a white or stripe black and white tee and by the way Athleta are starting to do more fair trade things which I love ( http://www.athleta.net/2017/02/24/our-new-fair-trade-line/). I have always been a fan of theirs since you can return anything anytime no questions. And they have great sales and I get many ideas of how to styles things from their website. I love my chambray shirt! 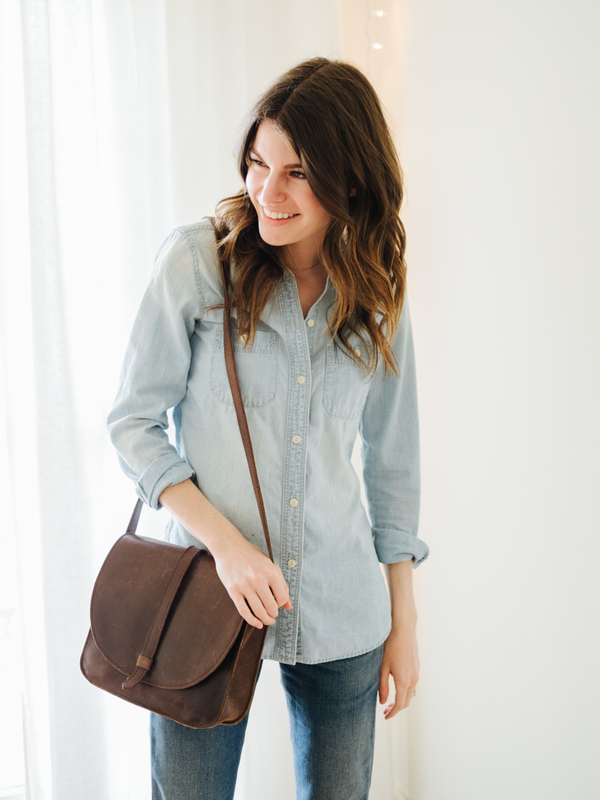 I have the lighter colored Madewell one, but I’d also like to find a nice one in a slightly darker blue color. I wear my current one with black skinny pants and a black quilted vest, though I’d also like to try it with my olive green military vest. Excited to see how you style it for spring and summer! My chambray shirt just recently made its way to the donate pile for a second and final time. The first time I hesitated because it fill well, worked great as a swimsuit cover-up when paired with jean shorts, and was overall comfortable and versatile. But I have the same mixed feelings as you — there’s just something about it that doesn’t work for me. It may have been the wash (it was very, very light), or perhaps how easily it wrinkled at the bottom and on the sleeves. I don’t miss it yet, but I wore it most often in the summer, so we’ll see how I feel in a few months! I especially love my chambray with a pair of “loud” cropped pants. The pants are black & white plaid. The chambray calms it down and makes it feel relaxed and happy instead of noisy and aggressive. Also, I almost always prefer wooden or shell buttons over white ones. Great suggestion earlier! This might be a bit much color/pattern for your style, but I have a chambray shirt with some happy patches on it and people LOVE IT. wearing it makes me smile, but it still feels like a neutral. you could even try it with a little detail on the arm or back so it’s not in your face every day – it really livened up my shirt. Chambray shirt tied at the waist, long black skirt, boots or booties, a statement necklace or a chunk of white or gold pearls, or turquoise tucked in the neckline. Chambray shirt, gray knitted pencil skirt, gray or black knee boots, silver jewelry. Black bag. And confidence. Always happy confidence. Under that black silk top you just got? Love the new wood buttons idea too! meh. i find them boring. no offense to everyone who has them, they look good! i get the appeal, but they’re very over done. 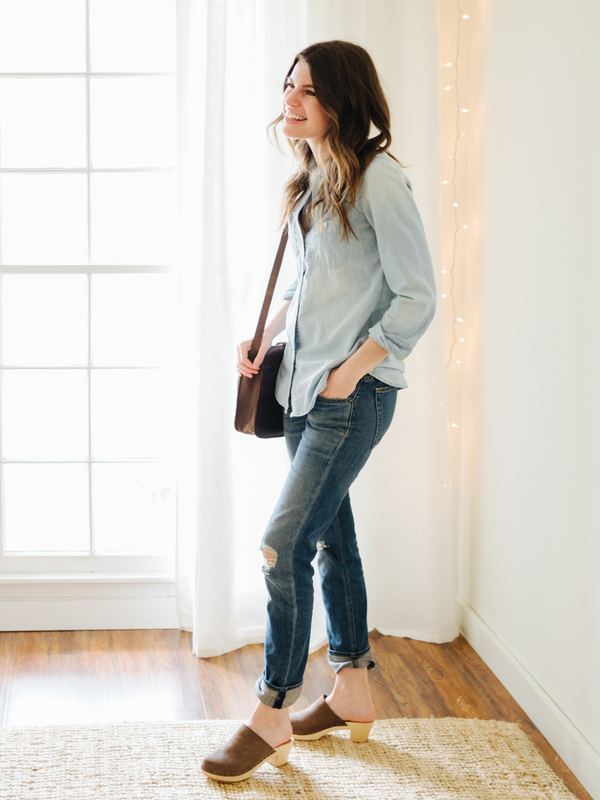 I’ve always loved chambray, it’s just so versatile and would elevate any too casual outfit! I love my chambray shirt! I wear it with black denim shorts in the summer with the sleeves rolled up and a Panama hat. I wear it in the winter with black skinnies and a black quilted vest. Can’t wait to see how you continue to style yours. Amazing Bag! Yeah I definitely have my go to chambray, it’s good for almost anything and it’s so cozy! I like to wear a thin turtleneck under my chambray shirt, or wear a slightly cropped sweater over it. Haha ! Feel exactly the same for the chambray shirt ! But yep, still in my closet ! I just agreed with myself that I’m letting the chambray go, but for the complete opposite reason. It just never works for me! Lots of great ideas in the comments! But like many have already said, if you’re feeling less than enthused about your chambray then I think it might be time to give it a little break. They say absence makes the heart grow fonder, so if you are dying to pull it out after a month then you know it’s a keeper. :) Plus now you have so many new ideas for styling it if/when it does come out of hibernation. Personally I haven’t pulled mine out in what feels like several, several weeks. I might replace it with a darker version like pp mentioned. I think you also had a post about dark chambray feeling more fresh? I love mine because it’s so soft. I wear it as a shirt or over a tank etc but if you’re over it, get one in another color. Athleta has one right now in military green! I agree chambray has been feeling played out lately! Having said that this winter I’ve been liking the look of mine either paired with a long cable-knit navy cardigan or or under an outerwear vest. I wore mine on Valentine’s Day with a cropped, winter white boucle jacket (that I’ve had for a decade), tucking it in to a thrifted knee-length flared out skirt (with pockets) and my old cognac Frye Melissa boots. I dressed it up with pearls! It looked really cute! It was one of my favorites this season! What about DIY’ing, like sewing a few stars onto it or trying to do a very Basic embroidery around the cuffs (where you can easily hide or Show) or the collar, or the upper back part? I don’t wear a lot of blue and especially not Jeans, but chambray Shirts still get my Attention. Maybe I should finde one, eventually. I absolutely love the look of a chambray shirt – just never have found one that works on me. I think it’s a ‘build’ thing, my shoulders are pretty broad so it makes me feel masculine if I wear a button up with no pattern? Regardless of my own chambray issues, I think you are always rocking them, they look so effortless and classy on you. Keep up the posts, always love them! I TRIED WEARING MINE OPEN LAST WEEK WITH A BASIC TEE UNDERNEATH – I LIKED IT, BUT IT DIDN’T FEEL 100% MY STYLE – IT WAS NICE TO WEAR IT A NEW WAY THOUGH! Your blog is my go to resource for when I need a little fashion evaluation; and this post really stuck with me. I’ve also been trying to find a refreshed way to wear my chambray top. I love it, but it’s starting to feel a little stale. I came across these (black) pants, and the more I eye ’em, the more I like ’em! I think they’d look great with a chambray top and clogs. Might be my next investment piece. Anyways, thanks for getting the wheels turning with this post! I know you’re not a print person but I love chambray most when it’s with a printed skirt or the bottom is tied on a striped maxi dress, etc. It’s a great neutral compliment for patterned/textured items in my wardrobe. I could also see it being cute left totally unbuttoned over a tank top and shorts in the late spring when weather is warm but morning/nights are cool. Yep. I definitely feel the same way. Thanks for the ideas!